We all have day to day Goals. 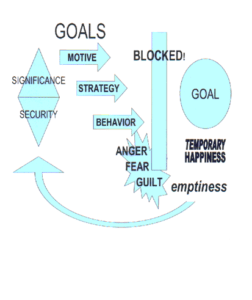 The wrong goals can end up providing a temporary happiness at best. That is just the way it works. Most every thing you do in your daily life is motivated by one, or two, driving questions. What can I do to increase my significance? There is a tremendous difference between Daily Goals and A Life Goal. Normally your daily goals are influenced by you life goal. With the wrong goals our daily lives can become a Roller Coaster, happiness and then frustration, happiness then anger, happiness then guilt. How does a person find a true Inner Peace? Okay, I have decided that there is a God. I have found the Savior, Jesus Christ, whom I realized was needed because we have all missed the mark concerning the issue of sin. I have believed in Him (based on his work on the cross) for my Eternal Salvation, so where is this peace that I was told God promised? Unfortunately, despite the fact that through belief in the work of Jesus Christ on the cross we have put on the “new man”, we still have a sinful nature. That is why it is a constant battle, to make the decision to let the Holy Spirit rule instead of our sinful nature. Here is what can happen if you do not make the correct moment by moment decision on who is ruling, your sinful nature or the Holy Spirit. Your sinful nature is motivated to set your daily goals according to your desires for Significance and Security. Then you develop a strategy to attain that goal. Next you carry out a behavior to fulfill the strategy. What happens if an outside source blocks your daily goal? You end up with feelings of Anger, or Fear, or Guilt, and then an emptiness. If you do succeed in your daily goal you may end up with a temporary Happiness. You can plug anything you wish into the illustration and it will fit. The road to Inner Peace! How does one handle the outcome of daily life? How do you stop the Roller Coaster, with its constant ups and downs? Answer: Set your Life Goal to line up with Gods desire for you. It is found within Mark 12:28-31. Doing this, will allow God to help you level your path. You cannot do it in your own strength. In order that you may know what He has already done for you. That you may know what He has already given you. In order to fully know and understand that God has already given you all the significance and security you need. Once you have decided to set your Life Goal to Love the Lord your God with all of your heart, soul, mind and strength and Love your neighbor as yourself, over time, failure to reach a Daily Goal will have little or no impact. Remembering to let the Holy Spirit have control over your life will allow God’s Word to help you set valid Daily Goals. This is not a magic formula. It can be a big effort, due to our sinful nature. Down load a copy of Goals. Illustration of making Goals that you set for yourself and what can happen when they are not met.